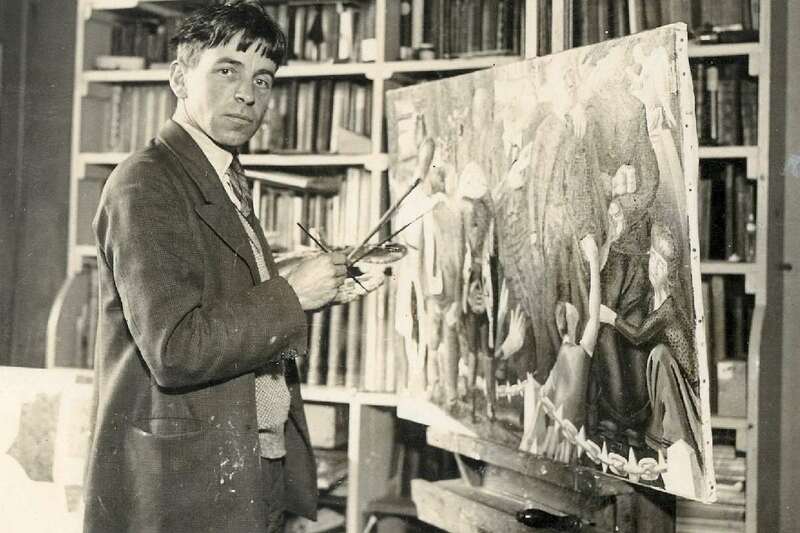 Although perhaps not very known to a wider public, Stanley Spencer is one of the most prolific UK painters who came to prominence during the interwar. 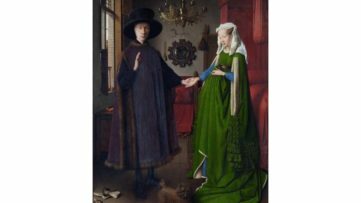 The oeuvre of this notable figure is marked by multi-figure compositions, in particular the ones referring to the Biblical scenes. Throughout the years, Spencer remained an authentic and slightly enigmatic artist whose stylistic and formal approach defies strict categorization. The exhibition space devoted to the artist was founded in 1962, and ever since it has been showing his works. However, the upcoming group exhibition, first to be organized by the gallery, called Counterpoint- Stanley Spencer and his Contemporaries aims to provide refreshed interpretation of the artist’s work in a broader historical context of Modern British art. The upcoming presentation curated by Amanda Bradley will mark the 60th anniversary of the Stanley Spencer’s death by exposing thirty-nine exceptional works, half of the loans are from the Stanley Spencer Gallery and half from the Ingram Collection, by the artist himself, but also by some of them the leading proponents of twentieth-century British art such as David Bomberg, Roger Fry or David Jones, as well as pieces produced by less known figures such as Dod Proctor and Glyn Philpot. 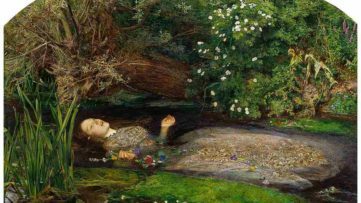 Early twentieth century Britain saw the coming of age of a singular group of artists. Some shared the background of their arts training at the Slade School of Art. Others were less directly connected to each other, but through the lens of their collective talents we experience seismic historic events (two world wars), and vast social and economic change. Each of the artists represented here experienced and portrayed this shared history with a particular vision and expression. 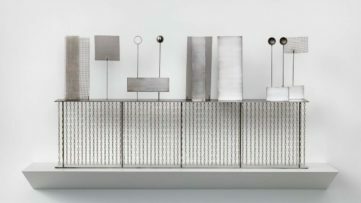 The exhibition’s title – Counterpoint – reflects the complementary and diverse artistic talents across the works on show. This particular survey will be conducted of seven thematic segments so that the audience can understand the significance of Spencer’s oeuvre in regards to the artistic currents of his time. 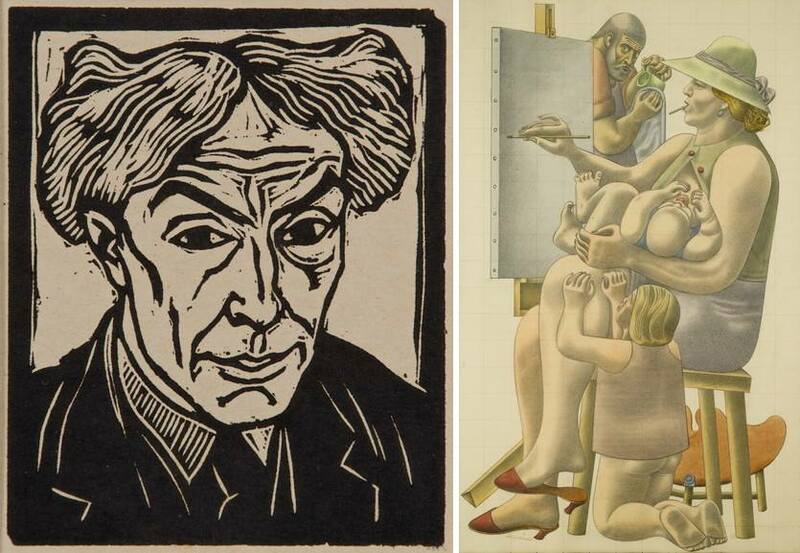 The first segment is called The Slade, indicating the early stage of his artistic persuasion; it will feature a lithograph made from Spencer’s self-portrait of 1913, a bronze figure by Henri Gaudier-Brzeska titled Maternity, a self-portrait woodcut by Roger Fry, Mark Gertler’s The Doll (1914), and a drawing Bargee Family (1919-20) by David Bomberg. The following segment The Great War will encompass four of Spencer’s works including Wounded Being carried by Mules in Macedonia (1918-19), Pack Mules (1918-1919), along with a portrait, Albert Henry Seager (1915), a 1918 portrait by Jacob Epstein, a lithograph by CRW Nevinson, Building Aircraft: Acetylene Welder (1917) and Eric Kennington’s Interior of an Adrian Hut (1917-1918). The third segment Religion will present a selection of religious paintings featuring Cookham, the idyllic Berkshire village where the artist was born and lived for long periods of his adult life. The fourth segment called Landscape will feature the works by David Jones and John Craxton, along with Spencer’s View from Cookham Bridge (1936) and The Mill, Durweston (1920). The portraits of Patricia Preece, the artist’s wife, will be on display together with painting Golden Girl by Dod Proctor, (c. 1930), and a portrait of Henry Lamb’s lover, Ottoline Morrell (1910-11) in a segment called The Artist’s Muse. The Long Weekend will present the interwar period with the works On the Beach (1934) by Robert Duckworth Greenham and The Swimming Bath (1959), by and William Roberts, while the final segment World War II will gather two drawings for Spencer’s large scale paintings Lithgows Shipyard, as well as lithograph, Burners by Barnett Freedman: Fifteen-Inch Gun Turret HMS Repulse (1941) (part of the same series commissioned by the National Gallery), as well as Ropes and Lorries painting by Edward Burra from 1942, and Civil Aviation produced John Armstrong around 1941 and 1942. The upcoming exhibition will shed new light on the often misunderstood painterly practice of Stanley Spencer and his continuous agenda of socially charged commentary. 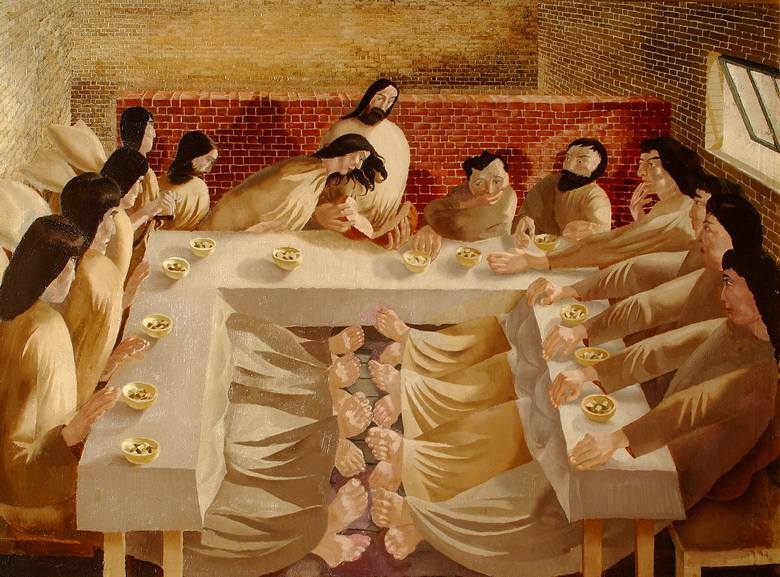 Counterpoint – Stanley Spencer and his Contemporaries will be on display at Stanley Spencer Gallery in the village of Cookham, Berkshire from 28 March until 3 November 2019. 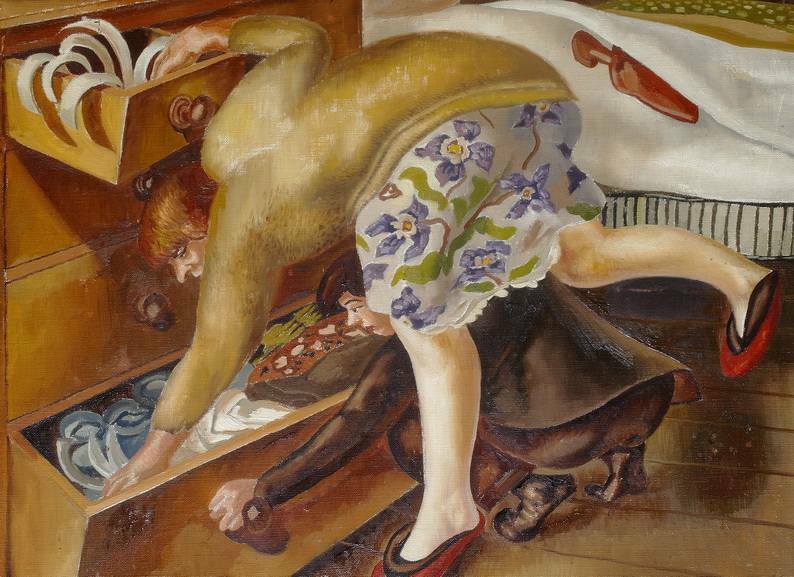 Featured images: Stanley Spencer painting Parents Resurrecting, 1933. Courtesy of the Stanley Spencer Gallery Archive; Stanley Spencer with the famous pram in Cookham, 1950s. Courtesy of the Stanley Spencer Gallery Archive.